Change comes quickly in the channel, and digital is accelerating that concept. 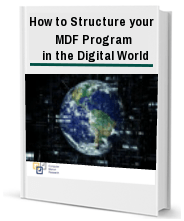 Although digital MDF program is a relatively young field, there is a great deal of complexity, risk, and “noise” out in the marketplace for business owners to sift through. As the internet touches every corner of the end-customers’ life, your channel must embrace its authority to survive. With an increasing shift of MDF program supported activities, funds are being diverted from traditional methods to paid advertising SEO, webinars, social media, email, video, etc. The new digital model works, but the same challenges exist. At the end of the day, who do end-customers trust, and who can help them make the right decisions on the tools to help them grow their businesses? Your partners can, but first, you must equip them to do so.